PETERBOROUGH, Ont. 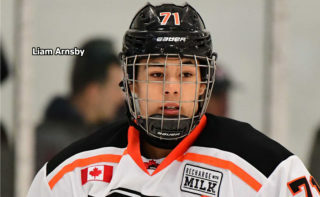 – Stephen Nosad scored at 19:53 of the third period to give the Peterborough Petes a 2-1 Ontario Hockey League victory Thursday night over the North Bay Battalion. 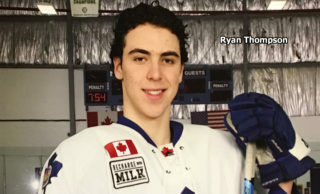 Nick Ritchie also scored for the Petes, who won a third consecutive game to move their won-lost-extended record to 5-6-3 for 13 points, fifth in the East Division. Goaltender Matthew Mancina made 43 saves before a crowd of 2,044 at the Peterborough Memorial Centre. Brenden Miller scored for the Battalion, which lost for the first time in three games and is 8-3-4 for 20 points, first in the Central Division. Goaltender Jake Smith faced 33 shots. Ritchie ended a scoreless tie at 5:54 of the third period, charging to the net and chipping a Steven Lorentz feed inside the left post. 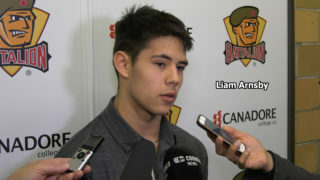 The Battalion tested Mancina but couldn’t find the equalizer until defenceman Miller struck at 14:47. Seconds after the goaltender denied Nick Paul at the right post, he provided a screen for Miller, who put home a wrister from the top of the left-wing circle. Kyle Wood earned the lone assist on Miller’s sixth goal of the season. The game opened up, with both teams enjoying chances, and Nosad collected the winner when he got enough of a loose puck in the slot to send it fluttering over Smith’s glove. Matt McCartney and Lorentz assisted on the goal. The Battalion outshot the Petes 14-9 in the first period, hardly indicative of what was a decided territorial advantage. The Troops’ best scoring chance came in the fifth minute when Mancina got his blocker on a Paul shot from the deep slot. Mancina also turned aside solid chances by Miller, Brett McKenzie, Mike Amadio and Alex Henriksson, who got loose on a play that was offside. Peterborough’s best opportunity came in the 18th minute, but Josh Coyle failed to finish a two-on-one rush with Josh MacDonald. The Troops, who enjoyed two second-period power plays, outshot the Petes 12-11. Smith was busy early in the frame, sprawling to deny an Eric Cornel chance in the fourth minute and foiling Nosad in the slot and Ritchie off a right-wing rush in the eighth. Smith turned aside an Adam Timleck backhander in the 10th minute before stopping a shorthanded chance by Lorentz in the 11th. Mancina denied Henriksson from deep in the left circle and foiled Ray Huether after he seized a loose puck in the slot. Mancini negated a McKenzie backhander at the lip of the crease and came out to challenge Paul late in the frame. 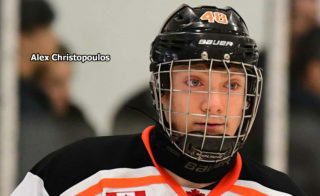 The Battalion visits the Kingston Frontenacs at 7 p.m. Friday. The game can be seen live in North Bay on TVCogeco Cable 12 and heard on Country 600 CKAT. BATTALION BULLETS: The Battalion, which played a penalty-free game, went 0-for-3 on the power play … North Bay goaltender Evan Cormier marked his 17th birthday … The Battalion lost in regulation time on the road for the first time this season. 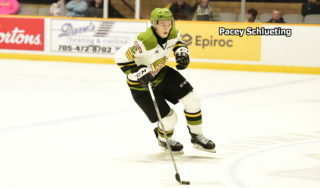 The Troops also have four wins and an overtime loss in six away games … The Battalion last lost a game in the final minute of the third period when Michael Dal Colle scored at 19:14 to give the visiting Oshawa Generals a 3-2 decision Feb. 16 … Mancina won his third game in three starts since an Oct. 24 trade from the Guelph Storm … Opening line combinations included Paul centring left winger Owen Green and Amadio on right wing, McKenzie pivoting left winger Zach Bratina and right winger Henriksson and Huether centring Jared Steege on left wing and right winger Mathew Santos. 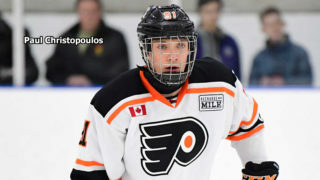 David Sherman centred left winger Mike Baird and right winger Hampus Olsson … The Battalion was without Riley Bruce, Zach Poirier, Mark Shoemaker and Calvin Gomes … Peterborough, which dressed 19 players, one below the limit, was without Dylan Wells, Matthew Timms, Greg Betzold, Jonathan Ang and Michael Clarke … Wells, Timms and Ang are at the World Under-17 Hockey Challenge at Sarnia and nearby Lambton Shores … Betzold drew a 15-game suspension Wednesday for offensive statements on a social medium.